The meeting is set to take place in Rome. FAI officials and British football chiefs are set to meet in Rome on Friday to discuss a potential joint bid for the 2030 World Cup, with a stadium shortlist being high on the agenda. It's believed that the leaders of the English, Irish, Northern Irish, Scottish and Welsh Football Associations are taking advantage of the opportunity presented by this week's UEFA Congress to get together for a second bid brainstorming session, having met for the first time in Dublin in December. In August, FA chairman Greg Clarke announced the English FA is conducting "feasibility work" into the possibility of being UEFA's candidate for the 2030 tournament but said no decision on whether to bid or not would be taken until later this year. The FAI published a statement in September which said that the development came on the back of recent positive discussions amongst all parties. It's understood that a decision on whether to bid or not is now unlikely to come before spring 2020 - but the delay is not believed to be related to any uncertainty about governmental support. In fact, that is the part of the plan the FAs are most confident about, with Prime Minister Theresa May describing a joint bid as a "tantalising possibility" that the British and Irish governments would back in a speech in Belfast this week. Taoiseach Leo Varadkar also welcomed the initiative. More concerning, though, are FIFA's stringent venue criteria, with some of the Premier League's biggest and most famous grounds not meeting the standard. For example, Anfield, Old Trafford and even the new White Hart Lane do not have sufficient 'run-off room' for players around the pitch, room behind the goals for the large number of World Cup photographers, or space surrounding the stadium for FIFA's broadcasting, commercial and hospitality operations. FIFA does give special dispensations and there is time for venues to make modifications - but the FAs are mindful of the need to present the most compliant and technically sound bid as possible. Another concern, though, is to get the right geographic split. London is not short of venues but nobody wants to make the bid too Londoncentric, so a maximum of three from the capital would be selected. However, FIFA's minimum capacity requirement of 40,000 poses a more fundamental challenge to Northern Ireland than worries about room for photographers, as Belfast's Windsor Park would have to more than double in size to be included in a bid. That might be more than the government or IFA is comfortable with as a long-term option, though, which would mean Northern Ireland's involvement would be limited to hosting events such as the draw and team training bases. If last year's bidding process for the 2026 World Cup is a guide, FIFA will want a minimum of 14 venues for a 48-team, 80-game tournament. And, as a further guide, the winning bid from Canada, Mexico and the United States is planning to use 16 venues. But there is one other great uncertainty related to the proposed bid and that is the need for European support. UEFA president Aleksander Ceferin, who was elected unopposed in Rome for a second term in charge, has made no secret of his desire for Europe to get behind one bid and he is believed to favour the British and Irish option. 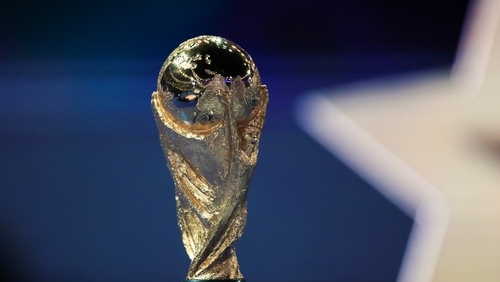 But Portugal and Spain have already said they would like to make a cross-confederation bid with North African neighbour Morocco, which lost out to the North American bid for 2026, while there is also talk of a joint bid from Bulgaria, Greece, Romania and Serbia. Sorting that out will be one of Ceferin's big challenges going forward, particularly as Europe's choice is likely to face stiff competition from a South American bid involving Argentina, Paraguay and Uruguay.